It is so, so temping to just copy all the text from our last 4-LOM review and see if anybody notices. 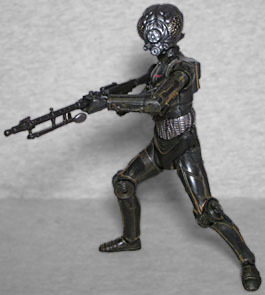 A rusty droid with insectile features, 4-LOM was originally a protocol droid, but logic glitches allowed him to escape his programming and become a bounty hunter. That proved a perfect occupation for the cold, calculating mechanical. "Mechanical"? Has anyone ever used "mechanical" in that way before? If you stop and think about what they're trying to say, it makes sense, but upon first blush it simply reads like there's a word missing from the end of the sentence. They're using "a mechanical" as a contrast against "an organic," but that isn't a normal way to use that term, either. Presumably since the copywriter had already used the word "droid" twice they didn't want to use it again, but why "mechanical"? Why not "machine"? Or better yet, add one more word to the sentence so it doesn't read like someone hit send on an email before they finished writing it. Being. Killer. Hunter. Robot. Man. Lifeform. Warrior. Falcon. Yardstick. Turban. Cabbage. Admit it: if the back of the box described 4-LOM as a "cold, calculating mechanical cabbage," you'd not only be intrigued, it would still make more sense than just calling him a mechanical. Like the bio says, 4-LOM began (mechanical) life as a protocol droid, albeit one designed for interacting with insectoid species, instead of humans. That's why his head looks like a big angry ant, rather than a surprised cough drop. There really is a surprising amount of detail on his head: rather than a smooth, featureless dome, this one has big, sculpted wrinkles over the bulging eyes, and various sensors in the mouthal region. Why was it so important that he have angry eyebrow ridges? Below the neck, 4-LOM looks like other protocol droids we're familiar with - in the real world, that's because he was made from leftover costume parts, while in the Star Wars world, it's because Industrial Automaton, the company behind the LOM-series droids, ripped the design off from Cybot Galactica and got sued into oblivion for it. 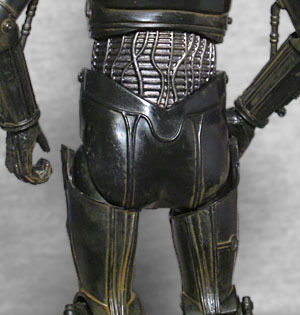 So there's a very skinny body, those big cylindrical knee joints, a gap in the belly exposing wires and tubing, and a big circular element on the stomach. 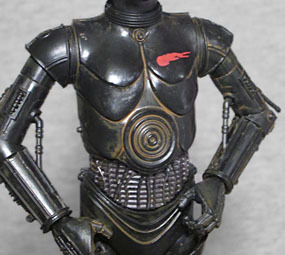 Rather than a paltry two squarish pectoral shapes, like most protocol droids, 4-LOM has four curving ones. Different! You would expect that, being the same type of body as C-3PO, this toy would have the same type of articulation as C-3PO: really good in most of the body, and then utter garbage in the arms, right? Well, yes and no. 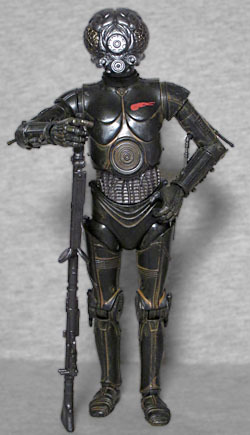 Lik 3PO, 4-LOM has swivel/hinge ankles, hinged knees, swivel thighs, balljointed hips and torso, swivel/hinge shoulders and wrists, and a balljointed head. Unlike 3PO, 4-LOM's arms aren't solid lumps of immobility! For one thing, he gets the swivel biceps that should have been in the arms to begin with, but more than that, Hasbro found a way to do what we said they couldn't - elbow joints! No, the pistons that link the forearms to the upper arms aren't functional, but the designers found a clever way around that: there's a trench on the forearm that the end of the piston mold slots into; as the elbow hinges up and down, the piston is free to slide through the trench, leaving it look appropriate while still providing more articulation than before. Is it a perfect representation of the film costume? No, but it's preferable to than no joints at all. Rather than a shiny gold, 4-LOM is a dark gunmetal grey with an orangey patina of rust near the seams. Is that something the beings he was built to deal with would appreciate? Like the way all the walls in Tipoca City looked plain white to us because Kaminoans see in ultraviolet? Perhaps bug people perceive things differently, and he doesn't look dark to them at all. His exposed belly-wires are silver, and there's a red streak on the left side of his chest. The head is molded from a translucent green plastic, then painted over, all in an effort to re-create the way his eyes looked in the movie. Since he's a bounty hunter, 4-LOM comes with his regular weapon, the DLT-19 heavy blaster rifle. Like a lot of Star Wars weapons, it was based on a World War II-era German gun (in this case, the MG 34). Thanks to the surprise inclusion of articulation, he can even hold it pretty well! I really only got 4-LOM to go along with the other Empire Strikes Back bounty hunters, and wasn't expecting a lot from him. But the advancements made since the release of C-3PO are wonderful, even if they kind of make us mad that 3PO turned out the way he did. But now that these improvements exist, Black Series C-3PX when, Hasbro?